What sort of music would birds make, if birds made music? Of course, they do make their own music every day. 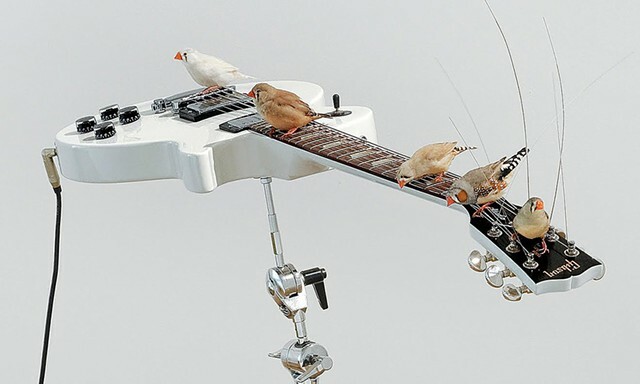 But French artist Céleste Boursier-Mougenot has taken it upon himself to construct an environment that is both aviary and live concert venue, employing birds to create serendipitous tunes. The installation “from here to ear v.19,” now at the Montréal Museum of Fine Arts, has brought more than 70 zebra finches to the museum’s Contemporary Art Square. There they formulate “music” by perching on the strings of 14 electric guitars, triggering prerecorded chords that emanate from corresponding amps. As the title suggests, this is the 19th incarnation of Boursier-Mougenot’s concept. It is also one of his largest. The artist has been devising variations on the project since 1999; this is its Canadian debut. The bird species is native to Australia, but these particular tweeters hail from a breeding farm in Thetford Mines, Quèbec. They are divided evenly between male and female. In other words, Boursier-Mougenot does things such as encourage birds to play Gibsons. Some artworks benefit remarkably from the presence of children, and “from here to ear” is one of them. During this writer’s visit, several little ones — ages roughly 3 to 10 — romped through the exhibition expressing the kind of delight that dispels pretension. The kids served as reminders that the crux of this work is the birds. Generally speaking, children do not particularly care that they’re in an art gallery, and neither do birds. Evidence of this is everywhere and provides one of the show’s most viscerally jarring aspects. It’s not often one gets to see birds decorating costly and otherwise pristine instruments with straw, or pooping on them. They are simply going about their business: eating and drinking from cymbals laid on the room’s sand floor, taking refuge in one of four nesting boxes and, of course, perching on guitars. In this sense, the music the birds create is incidental and accidental, enabling Boursier-Mougenot to raise some interesting questions. How are we supposed to evaluate music made by beings who do not care? How aware are the birds that they are making sound? What thrill do we get from juxtaposing these disparate types of (auditory and zoological) experience? To what extent is Boursier-Mougenot the author of this “work”? And what are the ethics of imposing unusual variables on animals for the sake of art? As with any human endeavor that exploits living things, a hearty dose of skepticism seems advisable here. For its part, the museum takes care to explain that the birds are cared for daily by animal technicians and checked weekly by a veterinarian. Not surprisingly, the music itself is unusual. Periods of complete silence are brief, but there is no recognizable rhythm. Sound bursts erratically from all sides of the enclosure. It’s easy to become obsessed with trying to discover patterns in the birds’ movement and the noises that resonate from the amplifiers. Boursier-Mougenot has created a thought-provoking, if controversial, performance piece that tests the bounds of authorship and discipline. One has to wonder who ends up more disoriented — us or the birds.